Part of a good orchid care program should be monitoring the temperature. Most people know that the delicate flowers should not get below a certain temperature. However, did you know that they can become too hot? In some cases, it may cause severe damage to the plant and the leaves will begin to drop off. Just take a look at what happened here. Most orchid types will do well if the temperature does not exceed 90F or 32C. 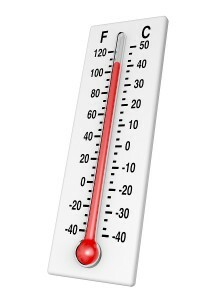 However, this temperature should not be maintained. Too much heat can be as bad as not enough heat. Some plants will need a period of time in cooler temperatures in order to flower. The phallangifera isn’t the only type that can be damaged by higher temperatures. The phalaenopsis orchid is another example. In most areas, your plants will naturally get less heat and light in the autumn. However, this is not always the case, as some people live in warmer climates. If you live in a warmer climate, you should consider placing your phalaenopsis in a temperature of about 60F or 16C at night. This should be done for a period of at least two weeks. This is important for Paphiopedilum, and Dendrobium orchids also. If you do this, you will have a much better chance of large, healthy blooms. In the summertime, never assume that the temperature is right for your orchids. Do not place the orchids in an area that is not air conditioned and leave them. For example, they will have a nice warm environment in an attic space. In the winter, they may stay warm enough to do well. However, in the summer, temperatures in attics can reach over 100F or 38C. This is enough to damage your orchids in a few hours. Be careful about placing them in windows in the summer. The sun can become very hot as it shines through windows. This is especially true if the plant has a window on one side and a curtain on the other. The curtain can act as an insulator and makes the window area very hot. Be careful about putting your orchids outside in the summer. They may seem fine on the patio. Yet, temperatures in the sun can get high enough to hurt the plants and maybe kill them. Everyone knows not to get their orchids too cold. However, it is just as important to keep them from getting too hot. Be careful where you place them in the summer months. Just click to read more about the phalaenopsis orchids and the 6 reasons why it is everyone’s favorite. I have a PHALAENOPSIS orchid, it has stopped flowering, I have cut it down and sealed the ends, it has a sticky substance on the leaves, could someone tell me if this is normal, if not what is the best way to treat it, it is my first orchid. Regards Sandra.